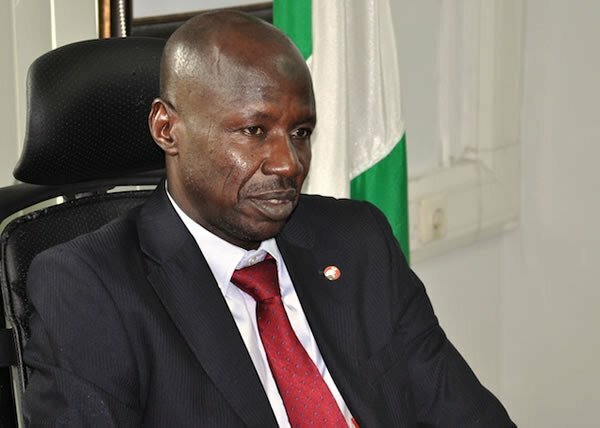 Acting Chairman of the Economic and Financial Crimes Commission (EFCC) Ibrahim Magu yesterday said the days of impunity are over. He urged Nigerians to unite against corruption for sustainable development in the country. Magu spoke after a walk to mark the 2017 International Anti-Corruption Day in Abuja. The walk which took-off from the EFCC Head Office, Wuse 2, Abuja en route Unity Fountain to Area 11 junction was with the theme, “United Against Corruption for Development Peace and Security”. Participants who moved amidst singing and dancing carried banners and placards such as “Say No To Corruption”; “Corruption Kills”; Corruption, Our Greatest Enemy”; “Kill Corruption Now”; “Do not be silent, blow the whistle to fight corruption” and “Let us make Nigeria Great Again”. They also had Red Cards boldly inscribed on their ‘T Shirts”, to symbolically send corruption out of Nigeria. The walk which held simultaneously in all the cities where the EFCC has offices, featured invited stakeholders from diverse sectors including the Public Compliant Commission, Nigeria Police, Independence Corrupt Practices and Other Related Offences Commission, ICPC; Nigeria Security and Civil Defence Corps, NSCDC; organized Labour, Ministry of Justice, staff of the Office of the Auditor-General for the Federation, youth organizations, civil society organizations and African Centre for Media and Information Literacy, AFRIMIL. The highpoint of the event was Magu’s address in which he urged Nigerians not to give up the fight against corruption. “Our country has witnessed a torrent of the adverse effects of corruption and we need to kill the monster of corruption before it kills our country. “I will never give up in making sure that corruption is completely eradicated in Nigeria. The days of impunity are gone”. Auditor-General of the Federation Anthony Mkpe Ayine who participated in the walk, urged Nigerians to own the fight against corruption because corruption had led to the decay of various sectors of the nation’s economy. Rallies and walks were staged in Ibadan, Port Harcpurt, Uyo, among others.